Our 500 litre water tank has a slim design, which is tough and durable suitable for small spaces within the garden. 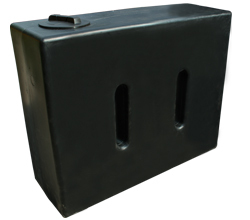 All of our water tanks are manufactured in our UK factory, from high quality medium density polyethylene. This 500 Litre water tank also comes fitted with an 8" vented lid.